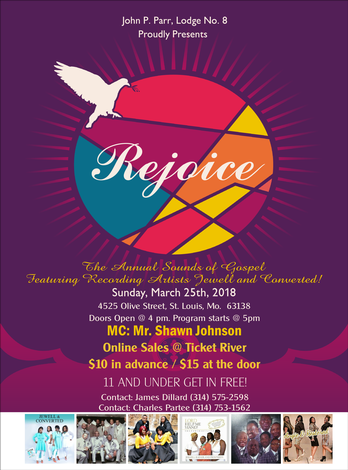 Come join the Brothers of John P. Parr, Lodge No.8 in celebrating the gospel through music on March 25, 2018 @ 4525 Olive Street, St. Louis, Mo., 63108. Doors open @ 4pm and the program starts @ 5pm. Enjoy the melodic sounds of Recording Artists Jewell and Converted, Prophecy, Angie and Restored, and The Silver Wings.